The base class for CCompartment, CMetab and CModelValue. 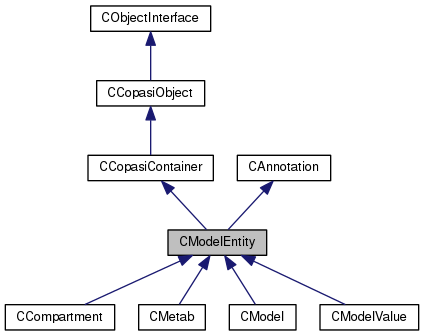 CModelEntity is a base class for CCompartment, CMetab and CModelValue. These three classes have in common that (in the long run) they can each be model variables (subject to ODEs), constant, or subject to algebraic assignments. In addition, the CMetab objects can also be subject to reactions, and conservation rules. Definition at line 39 of file CModelValue.h. Definition at line 53 of file CModelValue.h. Definition at line 62 of file CModelValue.cpp. References CKeyFactory::add(), CONSTRUCTOR_TRACE, CCopasiRootContainer::getKeyFactory(), CCopasiObject::getObjectType(), initObjects(), CAnnotation::mKey, mpIValue, and mpValue. Definition at line 87 of file CModelValue.cpp. References CKeyFactory::add(), CCopasiRootContainer::getKeyFactory(), CAnnotation::getMiriamAnnotation(), CCopasiObject::getObjectType(), initObjects(), CAnnotation::mKey, mpIValue, mpValue, mStatus, CAnnotation::setMiriamAnnotation(), and setStatus(). Definition at line 112 of file CModelValue.cpp. References DESTRUCTOR_TRACE, CModel::getStateTemplate(), mpIValue, mpModel, mpValue, pdelete, and CStateTemplate::remove(). 118 // therefore must destroy them. Definition at line 197 of file CModelValue.cpp. References ASSIGNMENT, CExpression::calcValue(), mpExpression, mpValue, mRate, mStatus, and ODE. Compile the model value. This is only needed for status ASIGNMENT and ODE. Reimplemented in CModel, and CMetab. Definition at line 143 of file CModelValue.cpp. References CCopasiContainer::add(), CCopasiObject::addDirectDependency(), ASSIGNMENT, CExpression::calcValue(), CExpression::compile(), CExpression::createInitialExpression(), CCopasiObject::getDirectDependencies(), CEvaluationTree::getInfix(), CCopasiObject::getObjectDataModel(), CEvaluationTree::isUsable(), mpExpression, mpInitialExpression, mpIValue, mpIValueReference, mpModel, mpRateReference, mpValueReference, mStatus, ODE, pdelete, CCopasiObject::setDirectDependencies(), and CCopasiObject::setObjectName(). Referenced by CModel::buildSimulatedSequence(), CModel::buildStateTemplate(), setExpression(), setExpressionPtr(), setInitialExpression(), and setInitialExpressionPtr(). 177 // Here we handle initial expressions for all types. 184 // If we have a valid initial expression, we update the initial value. 185 // In case the expression is constant this suffices other are updated lated again. Reimplemented in CMetab, and CCompartment. Definition at line 587 of file CModelValue.cpp. References mpIValueReference, mpRateReference, and mpValueReference. Referenced by CModel::appendDependentModelObjects(), CModel::determineIsAutonomous(), CCompartment::getDeletedObjects(), CMetab::getDeletedObjects(), mustBeDeleted(), CModel::removeModelValue(), CQGlobalQuantityDM::removeRows(), and CQModelValue::slotBtnDelete(). Retrieve the expression for non FIXED model values. Definition at line 236 of file CModelValue.cpp. References CEvaluationTree::getInfix(), isFixed(), mpExpression, and CExpression::updateInfix(). Referenced by CModel::convert2NonReversible(), CMathObject::createExtensiveODERateExpression(), CSBMLExporter::createRule(), CModelExpansion::duplicateCompartment(), CModelExpansion::duplicateGlobalQuantity(), CModelExpansion::duplicateMetab(), CQSpeciesDetail::load(), CQCompartment::load(), CQModelValue::load(), CQSpeciesDetail::save(), CQCompartment::save(), CQModelValue::save(), and CCopasiXML::saveModel(). Retrieve the pointer to the expression for non FIXED model values. Definition at line 250 of file CModelValue.cpp. Referenced by CSBMLExporter::checkForPiecewiseFunctions(), CSBMLExporter::checkForUnsupportedFunctionCalls(), CSBMLExporter::checkForUnsupportedObjectReferences(), CMathObject::compileRate(), CMathObject::compileValue(), CModelAdd::copyExpression(), CSBMLExporter::createRule(), CQGlobalQuantityDM::data(), CQCompartmentDM::data(), CQSpecieDM::data(), CModelExpansion::duplicateCompartment(), CModelExpansion::duplicateGlobalQuantity(), CModelExpansion::duplicateMetab(), CODEExporter::exportModelEntityExpression(), CODEExporter::exportModelValuesExpressions(), SBMLImporter::importRuleForModelEntity(), CModelMerging::mergeMetabolites(), SBMLImporter::removeUnusedFunctions(), CModelExpansion::replaceInModelEntity(), test000093::test_bug1503_1(), test000093::test_bug1503_2(), test000091::test_delay_in_kinetic_law(), test000091::test_delay_in_kinetic_law_local_parameter(), test000027::test_hasOnlySubstanceUnits(), test000034::test_hasOnlySubstanceUnits(), test000023::test_hasOnlySubstanceUnits(), test000025::test_hasOnlySubstanceUnits(), test000033::test_hasOnlySubstanceUnits(), test000087::test_import_reaction_flux_reference_2(), test000075::test_import_time_dependent_function_definition(), test000087::test_simulate_reaction_flux_reference_1(), and CMMLOutput::writeRHS_ModelEntity(). Definition at line 245 of file CModelValue.cpp. Retrieve the expression for ODE or REACTION model values. Definition at line 350 of file CModelValue.cpp. References ASSIGNMENT, CEvaluationTree::getInfix(), mpInitialExpression, mStatus, and CExpression::updateInfix(). Referenced by CModelAdd::addCompartmentsExpressions(), CModelAdd::addMetabolitesExpressions(), CModelAdd::addModelValuesExpressions(), CModel::buildInitialRefreshSequence(), CModel::convert2NonReversible(), CSBMLExporter::createCompartment(), CSBMLExporter::createMetabolite(), CSBMLExporter::createParameter(), CQGlobalQuantityDM::data(), CQSpecieDM::data(), CModelExpansion::duplicateCompartment(), CModelExpansion::duplicateGlobalQuantity(), CModelExpansion::duplicateMetab(), SliderDialog::fillSliderBox(), CQSimpleSelectionTree::filter(), CParticleReference::getDirectDependencies(), CQSpeciesDetail::load(), CQCompartment::load(), CQModelValue::load(), CModelMerging::mergeMetabolites(), CQSpeciesDetail::save(), CQCompartment::save(), CQModelValue::save(), CCopasiXML::saveModel(), test000041::test_hasOnlySubstanceUnits(), and test000040::test_hasOnlySubstanceUnits(). Definition at line 294 of file CModelValue.cpp. Referenced by CSBMLExporter::checkForUnsupportedFunctionCalls(), CSBMLExporter::checkForUnsupportedObjectReferences(), CMathObject::compileInitialValue(), CModelAdd::copyInitialExpression(), CSBMLExporter::createInitialAssignment(), CQGlobalQuantityDM::data(), CQCompartmentDM::data(), CQSpecieDM::data(), CModelExpansion::duplicateCompartment(), CModelExpansion::duplicateGlobalQuantity(), CModelExpansion::duplicateMetab(), SBMLImporter::importInitialAssignments(), CModelMerging::mergeMetabolites(), SBMLImporter::removeUnusedFunctions(), CModelExpansion::replaceInModelEntity(), test000093::test_bug1503_1(), test000040::test_hasOnlySubstanceUnits(), test000041::test_hasOnlySubstanceUnits(), and test000075::test_import_time_dependent_function_definition(). Definition at line 289 of file CModelValue.cpp. Definition at line 138 of file CModelValue.cpp. Referenced by CModelAdd::addCompartments(), CModelAdd::addModelValues(), CFunctionAnalyzer::constructCallParametersActualValues(), CMetab::convertToConcentration(), CMetab::convertToNumber(), CSBMLExporter::createCompartment(), CModelParameterSet::createFromModel(), CSBMLExporter::createMetabolite(), CSBMLExporter::createParameter(), CCSPMethod::cspstep(), CQGlobalQuantityDM::data(), CQCompartmentDM::data(), CQSpecieDM::data(), CModelExpansion::duplicateCompartment(), CModelExpansion::duplicateGlobalQuantity(), CODEExporter::exportCompartments(), CODEExporter::exportExpression(), CODEExporter::exportMetabolites(), CODEExporter::exportModelValues(), CModel::initializeAtolVector(), CQSpeciesDetail::load(), CQCompartment::load(), CQModelValue::load(), CReactionInterface::loadMappingAndValues(), CQUpdatesWidget::loadObjectsTable(), CModelParameter::refreshFromModel(), CMetab::refreshInitialConcentration(), CMetab::refreshInitialValue(), CQSpeciesDetail::save(), CQCompartment::save(), CQModelValue::save(), CQSpecieDM::setData(), CQSpeciesDetail::slotCompartmentChanged(), CModel::suitableForStochasticSimulation(), test000091::test_delay_in_kinetic_law_local_parameter(), test000026::test_hasOnlySubstanceUnits(), test000087::test_simulate_reaction_flux_reference_1(), and ParameterTable::updateTable(). Definition at line 367 of file CModelValue.cpp. Referenced by DataModelGUI::buildChangedObjects(), CModel::buildInitialRefreshSequence(), CMetab::compileInitialValueDependencies(), CMathObject::createExtensiveValueExpression(), CModelParameterSet::createFromModel(), CSBMLExporter::createInitialAssignment(), CExpression::createInitialExpression(), CMathObject::createIntensiveValueExpression(), test000097::createModel(), SliderDialog::determineCorrectObjectForSlider(), findObjectByDisplayName(), CMetab::getChildObjectUnits(), getInitialCNForSBase(), CModelParameter::getUnit(), SBMLImporter::importInitialAssignments(), CMathContainer::initializeObjects(), CQSimpleSelectionTree::populateTree(), SBMLImporter::replace_time_with_initial_time(), test000058::test_bug1025_10(), test000058::test_bug1025_2(), test000058::test_bug1025_4(), test000058::test_bug1025_5(), test000058::test_bug1025_7(), test000058::test_bug1025_9(), test000059::test_unique_id_1(), test000059::test_unique_id_12(), test000059::test_unique_id_14(), test000059::test_unique_id_17(), test000059::test_unique_id_18(), test000059::test_unique_id_19(), test000059::test_unique_id_20(), test000059::test_unique_id_21(), test000059::test_unique_id_21_2(), test000059::test_unique_id_3(), test000059::test_unique_id_6(), and test000059::test_unique_id_8(). Definition at line 131 of file CModelValue.cpp. Referenced by CModelAdd::addCompartments(), CModelAdd::addCompartmentsExpressions(), CModelAdd::addMetabolites(), CModelAdd::addMetabolitesExpressions(), CModelAdd::addModelValues(), CModelAdd::addModelValuesExpressions(), CModelAdd::addReactions(), CFixLocalReactionParameters::changeModel(), CQCompartment::copy(), CLayoutInitializer::createCompartmentGlyph(), CMathObject::createExtensiveReactionRateExpression(), CCopasiSpringLayout::createLayout(), CLayoutInitializer::createMetabGlyph(), test000097::createModel(), CSBMLExporter::createSBMLDocument(), CModelExpansion::duplicateCompartment(), CModelExpansion::duplicateGlobalQuantity(), CModelExpansion::duplicateMetab(), CModelExpansion::duplicateReaction(), CODEExporter::exportExpression(), CODEExporter::exportKineticFunction(), CODEExporter::exportMetabolitesConcentrations(), CODEExporter::exportModelEntityExpression(), CODEExporter::exportODEs(), CODEExporterBM::exportSingleCompartment(), CODEExporterXPPAUT::exportSingleCompartment(), CODEExporterC::exportSingleCompartment(), CODEExporterBM::exportSingleMetabolite(), CODEExporterXPPAUT::exportSingleMetabolite(), CODEExporterC::exportSingleMetabolite(), CODEExporterBM::exportSingleModelEntity(), CODEExporterXPPAUT::exportSingleModelEntity(), CODEExporterC::exportSingleModelEntity(), CODEExporterBM::exportSingleModVal(), CODEExporterXPPAUT::exportSingleModVal(), CODEExporterC::exportSingleModVal(), CODEExporterBM::exportSingleODE(), CODEExporterXPPAUT::exportSingleODE(), CODEExporterC::exportSingleODE(), CQSelectionWizardPage::fillTree(), getMetabGlyphForKey(), CMetabNameInterface::getMetaboliteKey(), CEFMTask::getSpeciesChanges(), SBMLImporter::importMIRIAM(), CCopasiSpringLayout::initFromLayout(), CQGlobalQuantityDM::insertRows(), CQCompartmentDM::insertRows(), CQSpecieDM::insertRows(), CODEExporterC::KineticFunction2ODEmember(), CModelMerging::mergeMetabolites(), CODEExporterC::preprocess(), CODEExporter::preprocess(), CCopasiSpringLayout::randomize(), CModelExpansion::replaceInReaction(), CCopasiXML::saveModel(), CQNewMainWindow::selectMetabolite(), CQGlobalQuantityDM::setData(), CQCompartmentDM::setData(), CQSpecieDM::setData(), CChemEq::setMultiplicity(), CModelMerging::simpleCall(), CModelExpansion::simpleCall(), CQEventWidget1::slotAddTarget(), CQSpeciesDetail::slotBtnNew(), CQCompartment::slotBtnNew(), CQModelValue::slotBtnNew(), CQEventWidget1::slotSelectObject(), CCopasiXMLParser::SourceParameterElement::start(), CCopasiXMLParser::ModifierElement::start(), CCopasiXMLParser::ProductElement::start(), CCopasiXMLParser::SubstrateElement::start(), CCopasiXMLParser::AssignmentElement::start(), CCopasiXMLParser::CompartmentGlyphElement::start(), CCopasiXMLParser::MetaboliteGlyphElement::start(), CCopasiXMLParser::TextGlyphElement::start(), test000091::test_delay_in_kinetic_law(), test000091::test_delay_in_kinetic_law_local_parameter(), test000087::test_simulate_reaction_flux_reference_1(), CSBMLExporter::updateMIRIAMAnnotation(), and CMMLOutput::writeRHS(). Definition at line 362 of file CModelValue.cpp. Referenced by CQGlobalQuantityDM::data(), CQCompartmentDM::data(), CQSpecieDM::data(), CQCompartment::load(), CQModelValue::load(), operator<<(), CMetab::refreshConcentrationRate(), and CQSpeciesDetail::setFramework(). Definition at line 373 of file CModelValue.cpp. Referenced by CMetab::compile(), CMathObject::createIntensiveRateExpression(), findObjectByDisplayName(), CMathContainer::initializeObjects(), and CQSimpleSelectionTree::populateTree(). Definition at line 637 of file CModelValue.cpp. Referenced by SBMLImporter::applyStoichiometricExpressions(), CSBMLExporter::collectIds(), CSBMLExporter::createCompartment(), SBMLImporter::createCReactionFromReaction(), CSBMLExporter::createInitialAssignment(), CSBMLExporter::createKineticLaw(), CSBMLExporter::createMetabolite(), CSBMLExporter::createParameter(), CSBMLExporter::createReaction(), CSBMLExporter::createRule(), CSBMLExporter::createRules(), CSBMLExporter::createSBMLDocument(), CSBMLExporter::createTimesTree(), SBMLImporter::replaceObjectNames(), CCopasiXML::saveModel(), test000055::test_bug1004(), test000057::test_bug1006(), test000103::test_bug1743_l2(), test000103::test_bug1743_l3(), and CEvaluationNodeObject::toAST(). Retrieve the status of the entity. Definition at line 141 of file CModelValue.cpp. Referenced by CModelAdd::addCompartments(), CModelAdd::addMetabolites(), CModelAdd::addModelValues(), CModel::buildInitialRefreshSequence(), CMetab::calculate(), CLNAMethod::calculateCovarianceMatrixReduced(), CSBMLExporter::checkForODESpeciesInNonfixedCompartment(), CSBMLExporter::checkForPiecewiseFunctions(), CEventAssignment::compile(), CMetab::compile(), CMetab::compileInitialValueDependencies(), CFunctionAnalyzer::constructCallParametersActualValues(), CModel::convert2NonReversible(), CSBMLExporter::createCompartment(), CCopasiSpringLayout::createLayout(), CSBMLExporter::createMetabolite(), CSBMLExporter::createParameter(), CSBMLExporter::createRule(), CQGlobalQuantityDM::data(), CQCompartmentDM::data(), CQSpecieDM::data(), CModelExpansion::duplicateCompartment(), CModelExpansion::duplicateGlobalQuantity(), CModelExpansion::duplicateMetab(), CODEExporter::exportCompartments(), CODEExporter::exportExpression(), CODEExporter::exportMetabolites(), CODEExporter::exportMetabolitesConcentrations(), CODEExporter::exportModelEntityExpression(), CODEExporter::exportModelValues(), CODEExporter::exportModelValuesExpressions(), CODEExporter::exportODEs(), CODEExporterBM::exportSingleCompartment(), CODEExporterXPPAUT::exportSingleCompartment(), CODEExporterC::exportSingleCompartment(), CODEExporterBM::exportSingleMetabolite(), CODEExporterXPPAUT::exportSingleMetabolite(), CODEExporterC::exportSingleMetabolite(), CODEExporterBM::exportSingleModelEntity(), CODEExporterXPPAUT::exportSingleModelEntity(), CODEExporterC::exportSingleModelEntity(), CODEExporterBM::exportSingleModVal(), CODEExporterXPPAUT::exportSingleModVal(), CODEExporterC::exportSingleModVal(), CQSimpleSelectionTree::filter(), CParticleReference::getDirectDependencies(), SBMLImporter::importRuleForModelEntity(), CSteadyStateTask::initialize(), CMathContainer::initializeObjects(), CSBMLExporter::isEventAssignmentSBMLCompatible(), CODEExporter::isModelEntityExpressionODEExporterCompatible(), CParticleReference::isPrerequisiteForContext(), CQSpeciesDetail::load(), CQCompartment::load(), CQModelValue::load(), CQUpdatesWidget::loadObjectsTable(), CModelMerging::mergeMetabolites(), CMetab::mustBeDeleted(), operator<<(), CQSimpleSelectionTree::populateTree(), CODEExporterC::preprocess(), CODEExporter::preprocess(), CMetab::refreshRate(), CMetab::refreshTransitionTime(), SBMLImporter::removeUnusedFunctions(), CSBMLExporter::replaceSpeciesReferences(), CQSpeciesDetail::save(), CQCompartment::save(), CQModelValue::save(), CCopasiXML::saveModel(), CQSpeciesDetail::setFramework(), CMetab::setObjectParent(), CMetab::setStatus(), CHybridMethodODE45::setupBalances(), CHybridMethod::setupBalances(), CHybridMethodLSODA::setupBalances(), CHybridMethodODE45::setupMetab2React(), CTauLeapMethod::start(), CStochDirectMethod::start(), CTrajAdaptiveSA::start(), CTrajectoryMethodDsaLsodar::start(), test000093::test_bug1503_1(), test000093::test_bug1503_2(), test000091::test_delay_in_kinetic_law(), test000091::test_delay_in_kinetic_law_local_parameter(), test000040::test_hasOnlySubstanceUnits(), test000023::test_hasOnlySubstanceUnits(), test000033::test_hasOnlySubstanceUnits(), test000025::test_hasOnlySubstanceUnits(), test000041::test_hasOnlySubstanceUnits(), test000026::test_hasOnlySubstanceUnits(), test000034::test_hasOnlySubstanceUnits(), test000027::test_hasOnlySubstanceUnits(), test000087::test_import_reaction_flux_reference_2(), test000075::test_import_time_dependent_function_definition(), CSteadyStateTask::updateMatrices(), CModelParameter::updateModel(), and ParameterTable::updateTable(). Definition at line 136 of file CModelValue.cpp. Referenced by CMetab::calculate(), CModel::calculateElasticityMatrix(), CQGlobalQuantityDM::data(), CQCompartmentDM::data(), CQSpecieDM::data(), CHybridMethod::fireReaction(), CHybridMethodLSODA::fireReaction(), CHybridMethodODE45::fireReaction(), CTSSAMethod::initializeAtol(), CSteadyStateMethod::isEquilibrium(), CQCompartment::load(), CQModelValue::load(), operator<<(), CMetab::refreshConcentration(), CMetab::refreshConcentrationRate(), CMetab::refreshNumber(), CSBMLExporter::replaceSpeciesReferences(), CMCAMethod::scaleMCA(), CQSpeciesDetail::setFramework(), CNewtonMethod::solveJacobianXeqB(), and CNewtonMethod::targetFunction(). Definition at line 484 of file CModelValue.cpp. Definition at line 490 of file CModelValue.cpp. Definition at line 370 of file CModelValue.cpp. Referenced by CMathModel::buildDependendRefreshList(), CMetab::compile(), CPlotSpecification::createDefaultPlot(), CMathObject::createExtensiveODERateExpression(), CMathObject::createExtensiveValueExpression(), CExpression::createInitialExpression(), CMathObject::createIntensiveRateExpression(), CMathObject::createIntensiveValueExpression(), CSBMLExporter::createRule(), CSBMLExporter::exportEventAssignments(), findObjectByDisplayName(), CModel::getCorrespondingTransientObject(), SBMLImporter::importEvent(), SBMLImporter::importRuleForModelEntity(), CMathContainer::initializeObjects(), CQSimpleSelectionTree::populateTree(), CReaction::setScalingFactor(), CMetab::setStatus(), CHybridMethodODE45::setupMetab2React(), CTauLeapMethod::start(), CStochDirectMethod::start(), CTrajAdaptiveSA::start(), and CTrajectoryMethodDsaLsodar::start(). Definition at line 495 of file CModelValue.cpp. References CStateTemplate::add(), CCopasiContainer::addObjectReference(), C_FLOAT64, CCopasiObject::getObjectAncestor(), CModel::getStateTemplate(), mpIValueReference, mpModel, mpRateReference, mpValueReference, mRate, mSBMLId, refreshInitialValue(), setInitialValue(), setInitialValuePtr(), CCopasiObject::setRefresh(), CCopasiObject::setUpdateMethod(), setValue(), setValuePtr(), CCopasiObject::ValueDbl, and CCopasiObject::ValueString. 525 // This creates the needed values. Check whether the entity is FIXED or not. Definition at line 124 of file CModelValue.h. Referenced by getExpression(), CMetab::refreshInitialConcentration(), CMetab::setConcentration(), setExpression(), and setExpressionPtr(). Definition at line 645 of file CModelValue.cpp. Referenced by CModel::buildUserOrder(), and CQUpdatesWidget::loadObjectsTable(). Definition at line 600 of file CModelValue.cpp. Definition at line 214 of file CModelValue.cpp. References CExpression::calcValue(), CEvaluationTree::getInfix(), mpInitialExpression, and mpIValue. Definition at line 221 of file CModelValue.cpp. References compile(), isFixed(), mpExpression, mpModel, CModel::setCompileFlag(), and CExpression::setInfix(). Referenced by CModel::convert2NonReversible(), CModelAdd::copyExpression(), CModelExpansion::duplicateCompartment(), CModelExpansion::duplicateGlobalQuantity(), CModelExpansion::duplicateMetab(), CQEventWidget1::loadFromEvent(), CQSpeciesDetail::save(), CQCompartment::save(), CQModelValue::save(), test000058::test_bug1025_10(), test000058::test_bug1025_5(), test000059::test_unique_id_17(), test000059::test_unique_id_18(), test000059::test_unique_id_19(), test000059::test_unique_id_20(), test000059::test_unique_id_21(), and test000059::test_unique_id_21_2(). Definition at line 255 of file CModelValue.cpp. References CCopasiContainer::add(), compile(), isFixed(), mpExpression, mpModel, pdelete, CModel::setCompileFlag(), CCopasiObject::setObjectName(), and CCopasiObject::setObjectParent(). Definition at line 333 of file CModelValue.cpp. References ASSIGNMENT, compile(), mpInitialExpression, mpModel, mStatus, CModel::setCompileFlag(), and CExpression::setInfix(). Referenced by CModel::convert2NonReversible(), CModelAdd::copyInitialExpression(), CModelExpansion::duplicateCompartment(), CModelExpansion::duplicateGlobalQuantity(), CModelExpansion::duplicateMetab(), CCopasiXMLParser::ModelElement::end(), CQSpeciesDetail::save(), CQCompartment::save(), CQModelValue::save(), CQMoietiesTaskResult::slotCreateGlobalQuantity(), and CModelParameter::updateModel(). Definition at line 299 of file CModelValue.cpp. References CCopasiContainer::add(), ASSIGNMENT, compile(), mpInitialExpression, mpModel, mStatus, pdelete, CModel::setCompileFlag(), CCopasiObject::setObjectName(), and CCopasiObject::setObjectParent(). Definition at line 383 of file CModelValue.cpp. Referenced by CModel::createCompartment(), CModel::createModelValue(), CModel::determineIsAutonomous(), initObjects(), CCompartment::load(), CMetab::operator=(), CQSpeciesDetail::save(), CQCompartment::save(), CQModelValue::save(), CQGlobalQuantityDM::setData(), CQCompartmentDM::setData(), CQSpecieDM::setData(), CQSpeciesDetail::slotBtnNew(), and CModelParameter::updateModel(). Definition at line 531 of file CModelValue.cpp. References C_FLOAT64, mpIValue, mpIValueReference, and CCopasiObjectReference< CType >::setReference(). Referenced by CStateTemplate::add(), initObjects(), and CStateTemplate::remove(). Definition at line 549 of file CModelValue.cpp. References CStateTemplate::add(), C_FLOAT64, CCopasiObject::getObjectAncestor(), CModel::getStateTemplate(), mpIValue, mpModel, mpValue, pdelete, CStateTemplate::remove(), and CCopasiObject::setObjectParent(). Referenced by CCopasiDataModel::commonAfterLoad(), and CMetab::setObjectParent(). Definition at line 388 of file CModelValue.cpp. Definition at line 632 of file CModelValue.cpp. Referenced by SBMLImporter::createCCompartmentFromCompartment(), SBMLImporter::createCMetabFromSpecies(), SBMLImporter::createCModelFromSBMLDocument(), SBMLImporter::createCModelValueFromParameter(), CSBMLExporter::createCompartment(), CSBMLExporter::createMetabolite(), CSBMLExporter::createParameter(), CCopasiXMLParser::SBMLMapElement::start(), test000103::test_bug1743_l2(), and test000103::test_bug1743_l3(). Definition at line 395 of file CModelValue.cpp. References CCopasiContainer::add(), ASSIGNMENT, calculate(), CCopasiObject::clearRefresh(), CExpression::createInitialExpression(), FIXED, CCopasiObject::getDirectDependencies(), CCopasiObject::getObjectDataModel(), mpExpression, mpInitialExpression, mpIValueReference, mpModel, mpRateReference, mpValue, mpValueReference, mRate, mStatus, mUsed, ODE, pdelete, REACTIONS, CModel::setCompileFlag(), CCopasiObject::setDirectDependencies(), CCopasiObject::setObjectName(), CCopasiObject::setRefresh(), setValuePtr(), and TIME. Referenced by CModelAdd::addCompartments(), CModelAdd::addModelValues(), CCompartment::CCompartment(), CModel::CModel(), CModelEntity(), CModelExpansion::duplicateCompartment(), CModelExpansion::duplicateGlobalQuantity(), SBMLImporter::importRuleForModelEntity(), CQCompartment::save(), CQModelValue::save(), CQGlobalQuantityDM::setData(), CQCompartmentDM::setData(), CMetab::setStatus(), test000058::test_bug1025_10(), test000058::test_bug1025_5(), test000059::test_unique_id_17(), test000059::test_unique_id_18(), test000059::test_unique_id_19(), test000059::test_unique_id_20(), test000059::test_unique_id_21(), and test000059::test_unique_id_21_2(). 402 // An assignment may not have an initial expression. 404 // to be deleted. Definition at line 642 of file CModelValue.cpp. Referenced by CModel::buildStateTemplate(), and CModel::CModel(). Definition at line 378 of file CModelValue.cpp. Referenced by CHybridMethod::fireReaction(), CHybridMethodLSODA::fireReaction(), CHybridMethodODE45::fireReaction(), initObjects(), CQSpecieDM::setData(), and CStochMethod::updateSystemState(). Definition at line 540 of file CModelValue.cpp. References C_FLOAT64, mpValue, mpValueReference, and CCopasiObjectReference< CType >::setReference(). Referenced by CStateTemplate::add(), initObjects(), CStateTemplate::remove(), and setStatus(). Definition at line 336 of file CModelValue.h. Referenced by calculate(), CMetab::calculate(), compile(), CMetab::compile(), getExpression(), getExpressionPtr(), setExpression(), setExpressionPtr(), setStatus(), and CMetab::setStatus(). Definition at line 341 of file CModelValue.h. Referenced by compile(), CMetab::compile(), CMetab::compileInitialValueDependencies(), getInitialExpression(), getInitialExpressionPtr(), CMetab::refreshInitialConcentration(), refreshInitialValue(), setInitialExpression(), setInitialExpressionPtr(), and setStatus(). Pointer to the initial value of the model entity. Definition at line 326 of file CModelValue.h. 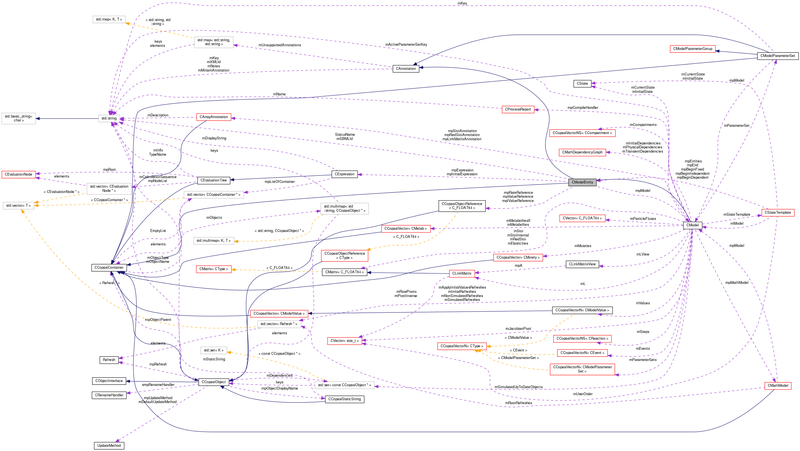 Referenced by CCompartment::CCompartment(), CModel::CModel(), CModelEntity(), compile(), CModel::getInitialTime(), getInitialValue(), CModel::initObjects(), CModel::load(), operator<<(), CMetab::refreshInitialConcentration(), refreshInitialValue(), CMetab::refreshInitialValue(), CModel::setInitialTime(), setInitialValue(), setInitialValuePtr(), setObjectParent(), CModel::~CModel(), and ~CModelEntity(). Definition at line 356 of file CModelValue.h. Referenced by CMoiety::add(), compile(), CMetab::compileInitialValueDependencies(), CMetab::compileIsInitialConcentrationChangeAllowed(), CCompartment::getChildObjectUnits(), CMetab::getChildObjectUnits(), getDeletedObjects(), getInitialValueReference(), CCompartment::initObjects(), initObjects(), CMetab::initObjects(), CModel::initObjects(), setInitialValuePtr(), and setStatus(). Definition at line 359 of file CModelValue.h. Referenced by CMetab::calculate(), compile(), CMetab::compile(), CCompartment::getChildObjectUnits(), CMetab::getChildObjectUnits(), CMetab::getModel(), initObjects(), operator<<(), CMetab::operator=(), CMetab::refreshConcentration(), CMetab::refreshConcentrationRate(), CMetab::refreshInitialConcentration(), CMetab::refreshInitialValue(), CMetab::refreshNumber(), setExpression(), setExpressionPtr(), setInitialExpression(), setInitialExpressionPtr(), setObjectParent(), setStatus(), CMetab::setStatus(), and ~CModelEntity(). Definition at line 358 of file CModelValue.h. Referenced by compile(), CMetab::compile(), CCompartment::getChildObjectUnits(), CMetab::getChildObjectUnits(), getDeletedObjects(), getRateReference(), initObjects(), CMetab::initObjects(), CMetab::mustBeDeleted(), setStatus(), and CMetab::setStatus(). Pointer to the value of the model entity. Definition at line 321 of file CModelValue.h. Referenced by calculate(), CMetab::calculate(), CModel::CModel(), CModelEntity(), CModel::getTime(), getValue(), getValuePointer(), CModel::initObjects(), operator<<(), CMetab::refreshConcentration(), CMetab::refreshNumber(), CMetab::refreshTransitionTime(), setObjectParent(), setStatus(), CModel::setTime(), setValue(), setValuePtr(), CModel::~CModel(), and ~CModelEntity(). Definition at line 357 of file CModelValue.h. Referenced by CMoiety::add(), compile(), CMetab::compile(), CModel::compile(), CCompartment::getChildObjectUnits(), CMetab::getChildObjectUnits(), getDeletedObjects(), getValueObject(), getValueReference(), CCompartment::initObjects(), initObjects(), CMetab::initObjects(), CModel::initObjects(), setStatus(), CMetab::setStatus(), and setValuePtr(). Definition at line 331 of file CModelValue.h. Referenced by calculate(), CMetab::calculate(), CMetab::compile(), getRate(), initObjects(), CModel::initObjects(), operator<<(), CMetab::operator=(), CMetab::refreshConcentrationRate(), CMetab::refreshRate(), CMetab::refreshTransitionTime(), setRate(), and setStatus(). The id of the corresponding parameter in an SBML file. This value is either set upon importing an SBML file, or when the object is first exported to an SBML file. Definition at line 47 of file CModelValue.h. Referenced by getSBMLId(), initObjects(), and setSBMLId(). Status of the model entity. Definition at line 347 of file CModelValue.h. Referenced by calculate(), CModelEntity(), compile(), getInitialExpression(), getStatus(), isFixed(), setInitialExpression(), setInitialExpressionPtr(), and setStatus(). Definition at line 353 of file CModelValue.h. Referenced by isUsed(), setStatus(), and setUsed(). Definition at line 67 of file CModelValue.h. Referenced by CQCompartment::CQCompartment(), CQCompartmentDM::CQCompartmentDM(), CQGlobalQuantityDM::CQGlobalQuantityDM(), CQSpecieDM::CQSpecieDM(), CQSpeciesDetail::CQSpeciesDetail(), CQGlobalQuantityDM::data(), CQCompartmentDM::data(), CQSpecieDM::data(), CODEExporter::exportCompartments(), CODEExporter::exportMetabolites(), CODEExporter::exportMetabolitesConcentrations(), CODEExporter::exportModelEntityExpression(), CODEExporter::exportModelValues(), CQGlobalQuantityDM::flags(), CQCompartmentDM::flags(), CQSpecieDM::flags(), CQModelValue::init(), CQSpeciesDetail::load(), CQCompartment::load(), CQModelValue::load(), StateSubwidget::loadCompartments(), StateSubwidget::loadMetabolites(), StateSubwidget::loadModelValues(), CQUpdatesWidget::loadObjectsTable(), CQGlobalQuantityDM::setData(), CQCompartmentDM::setData(), CQSpecieDM::setData(), and CQParameterOverviewDM::typeData(). Definition at line 72 of file CModelValue.h. Referenced by CCopasiXML::saveModel(), CCopasiXML::saveModelParameter(), CCopasiXMLParser::ModelParameterElement::start(), CCopasiXMLParser::MetaboliteElement::start(), CCopasiXMLParser::CompartmentElement::start(), and CCopasiXMLParser::ModelValueElement::start().